The Statue of Liberty was France's gift to America. On the fashion front, designer Catherine Malandrino brought Parisian chic stateside. 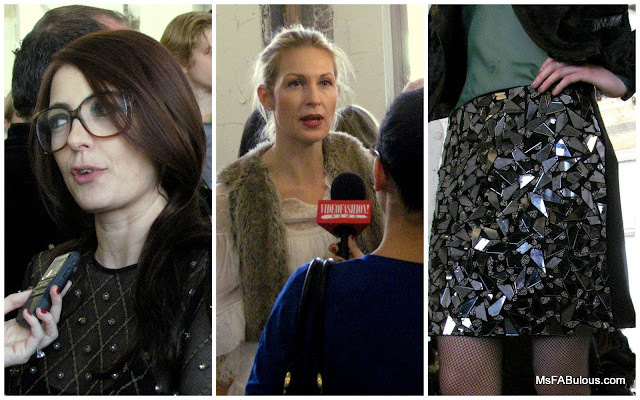 Her collection for Fall 2011 was presented in a raw loft space in Midtown Manhattan. There was a mix of tailored jackets, form-defining knits and sophisticated dresses for the Lady who does everything. The color palette included deep red, royal purple and emerald with some basic black thrown in. Stripes and polka dots accented a few looks as well. My personal favorite was the stand-alone mirror embroidered skirt. Ms. Malandrino explained that she designed the season’s looks for women to wear from day into evening. The presentation represented the wardrobe of the woman she represents…Successful and confidently stylish. With intellectual glasses and hats, the models looked like they walked directly out of the designer’s own closet. Other accessories included large pieced necklaces and chunky embellished bracelets.